In a snap, I went from being in top shape to joining the couch potato community. I was a hard-core athlete to suddenly having a hard time walking up the stairs. It’s been around 6 months, and fortunately I’m beginning to regain it all back. What’s been the best part of this experience? A greater confidence in my body’s ability to bounce back from setbacks, AND a newfound appreciation of the benefit of complete rest and adequate base training. As some of you know, I suddenly experienced significant and painful symptoms in my chest while racing the Hamilton Half Marathon. I was forced to take a month off (no exercise whatsoever) and oddly enough, I didn’t go stir crazy. Part of my sanity was due to my readiness for a break; the other part was my wisdom kicking in (this wouldn’t be the first time that I’ve had to bounce back!). As my body healed, I slowly started exercising – starting with 1 day of 20 minutes of light activity followed by 2 days off. Over the next few months, I progressed to exercising 3, 4 then 5 days a week. But, no hard efforts allowed. Finally, in late March, I was able to start throwing in some moderate intensity workouts. If I tried to go too hard, my body would quickly remind me that I was not yet ready. It’s now early May. Am I able to execute the same hard workouts I was accustomed to last year? Not quite. But on the plus side, I know that I am getting much stronger, fitter, and faster.Proof? I just won (female) the North Face Endurance Challenge in New York State in the half marathon (trail). I was also 11th overall (I like chasing the boys). Focusing on what I can do, rather than what I can’t do. It’s so easy to think about what we are not doing, the fitness lost, etc; that just creates negativity rather than optimism. I just continued to stay focused on my progress and felt grateful for the activity that I was able to do. Keeping busy! I filled my time with other priorities that had been on the back burner during my training days-this enabled me to feel more balanced, fulfilled and happy. Running free! Not having a structured plan to follow worked well, as I simply ran when I felt like it, and when it was convenient (remember those cold winter days where you wanted to stay in bed?). It was also very liberating to not be tied down to a structured plan. Disclaimer: my coaching skills came in handy to help determine appropriate runs and I’m a good self-motivator to get myself out the door! Setting new and fun goals. Knowing that I couldn’t work on top-end speed but could run long and slow, I decided to pick races that would be amenable to this. And why not do a few races that I’ve been longing to do? 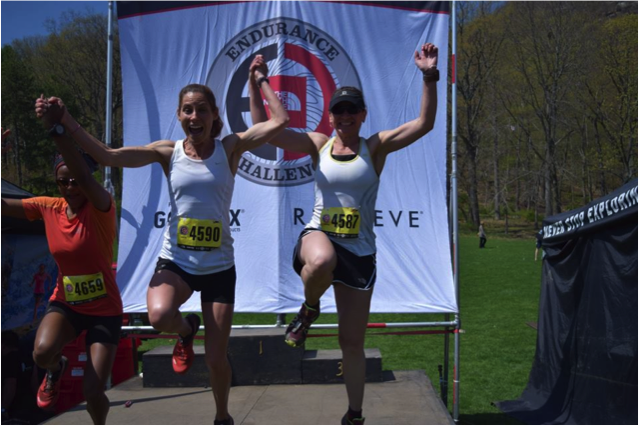 On my list: a ½ marathon trail race in NY state, a 37k trail race in the French Alps, Cabot Trail Relay and hopefully a 50k race trail (says the girl who has yet to run a marathon!). Establishing my base. This point should not be underestimated. It’s so easy for us runners to jump straight into harder workouts, wanting to push ourselves further. I’m certainly guilty of this, only to end up injured or feeling burned out. This time, things were different; my injury forced me to hang out longer than ever in the foundation or base phase-even with my cross training activities. This resulted in feeling rested and allowing my body to regain the necessary strength and resistance. And once I was ready to start moderate intensity workouts, I resisted the urge to start doing intervals, but instead focused on steady runs with a slightly more challenging pace. I’m only now starting to do KM repeats. Do I have that top end speed back? Not yet, but I’m not planning on doing any 5K soon; but I am close to my half marathon pace I think! And I’m still feeling rested. Finally, the other factor is BELIEVING. I simply chose to believe that I would come back strong – if I had wanted it (after all, it is a choice). Whereas some may focus on the fitness lost and be discouraged with age creeping in, I figured I had just as much chance of a comeback as no comeback. So why focus on the glass half empty? I would much rather have hope and have something to look forward to, only to be proven wrong. I would have more fun in the process, compared to if I just admitted defeat. And you know what? I’ve been having a blast. And getting stronger, fitter and faster!